If you’re not hip to the lingo, let me groove you cats. Yeah, this is my game design blog, so nobody’s going to freak out and say, “Hey, wait, you’re a geek!” But the point of Speak Out With Your Geek Out is manifold, like, say, demonstrating that I know how to properly use the word “manifold”. Being a geek is not a single planet or star but a whole galaxy of different things, all of which are linked by what John Green calls… actually, you know, since this is the Internet, I’ll just link you. To call me a game creator or even a gamer isn’t even getting to the most geeky things about me. What else is there? * I’m working on my Ph.D. about a poet most of you have never heard of, and I can easily bend your ear about Harry Crosby, down to his favorite brand of Scotch or the story about him tossing over the desk at his job at his uncle J.P. Morgan’s bank on the third day there and walking out in 1923. I also have things to say, strongly opinionated ones at that, about how literary canons are formed and the history of the typewriter and how all of that is an excuse for editors to save paper (literally) in populating anthologies. * I used to build combat robots. Well, a robot. His name was Misfit, and he was a two-wheeled scrapper with interchangeable arms. He lived on my dining room table until I ran out of money. He was awesome. * A couple years ago, as part of a creative challenge, I put out a CD in one month, created completely in my bedroom. You can have it free if you want. * I teach myself things simply because I learn about them and they fascinate me. I spent a year learning about Tiffany glass after seeing some for the first time in person in Petersburg, VA; before that, it was restoring vintage typewriters. Even though I’m terrible at playing guitar, I know an inordinate amount about the history of the electric guitar and how they work and who plays what kind. I’ve also learned about bookbinding, I’ve been a radio DJ, and I’ve learned about distilling and brewing, all just in the past several years. 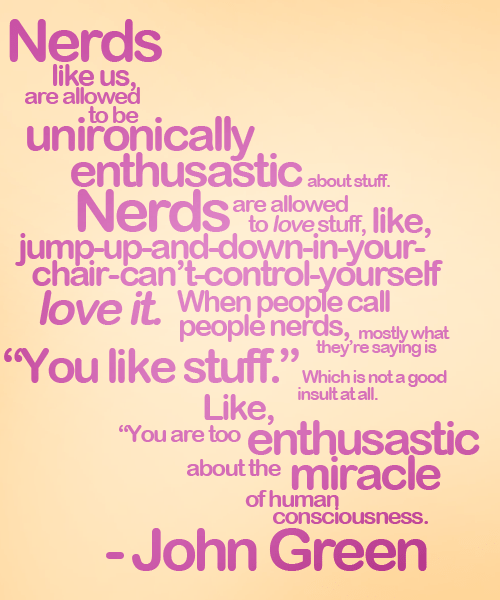 So, this goes out to all my fellow infovores: being a geek or a nerd or whatever appellation you want to throw out there is simply about knowing things and loving it and craving more. You can focus on one thing, or you can hop from subject to subject. Doesn’t matter. Just rock it, whatever it is.